Change the monotonous look of your wall with the Zeus wall clock which has been made of superior quality materials and ensures durability. The Zeus wall clock will help adorn your wall decor due to its fine craftsmanship. This decorative wall clock has been diligently crafted by proficient artisans of using various traditional techniques. The clock has a circular shaped dial and triangular pieces attached to it giving it the look of rays of the sun spreading out and is decorated alternately with pearls attached at the end of a thin gold colored metal strand giving the piece a shiny and glamourous look. The wall clock has been designed beautifully to last long with very little maintenance and easy cleaning. It is a must have wall accessory for those who want to give their homes a stylish and modern look. This uniquely design wall clock is available in a cool sea green color giving an aqua mist feel to the clock making it look further more attractive. 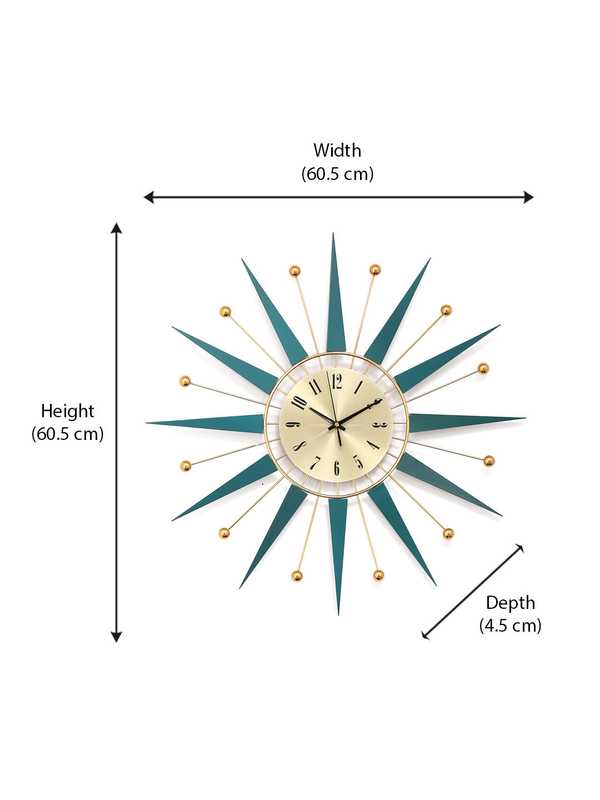 The wall clock has a height and width of about 60.5cm and a depth of 4.5cm. This piece is sure to be admired by your guests. Gift your loved ones this wall clock to make there celebrations and festivities memorable as this piece befits itself amazingly with any color scheme and can make place for itself in the kitchen walls, bedroom walls, living area and office walls. Buy this valuable piece of art from @Home, a one stop-shop for home decor and furniture.